Genea-Musings: Dear Randy: How Best to Save Your Genealogy Work? Dear Randy: How Best to Save Your Genealogy Work? "A couple of us were talking yesterday about long term storage and the best way to put genealogy on the computer; especially for handing it down to younger family members who might not keep it up. Programs change as do computers. We want to get it saved as much for the long term as possible. Is there an answer?" 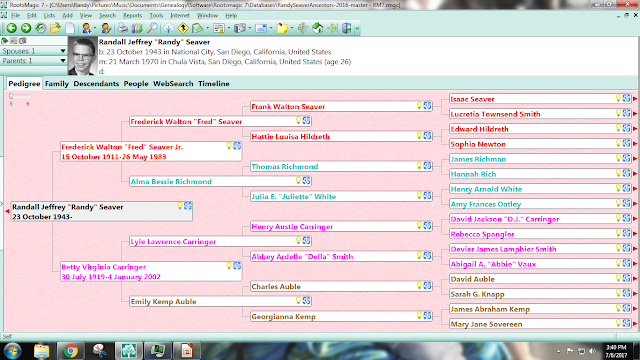 1) Put as much information as possible into profiles on the FamilySearch Family Tree for my ancestors and other persons. For instance, I am adding events, sources, notes, a life sketch, and photographs to the profiles in addition to the basic vital records. I think that the FamilySearch Family Tree has an excellent chance of surviving for decades, as long as someone doesn't intentionally sabotage or destroy my ancestors' profiles. 2) Keep my public Ancestry Family Tree updated using RootsMagic TreeShare on a regular basis. In this way, other Ancestry users can search for and find my information without anyone being able to change it. 3) Every few years, write multi-generational ancestor and descendant narrative reports using genealogy software (e.g., RootsMagic, Legacy Family Tree, etc.) and save them as PDF files online. These are names, relationships, dates, places and sources only - no notes or media. 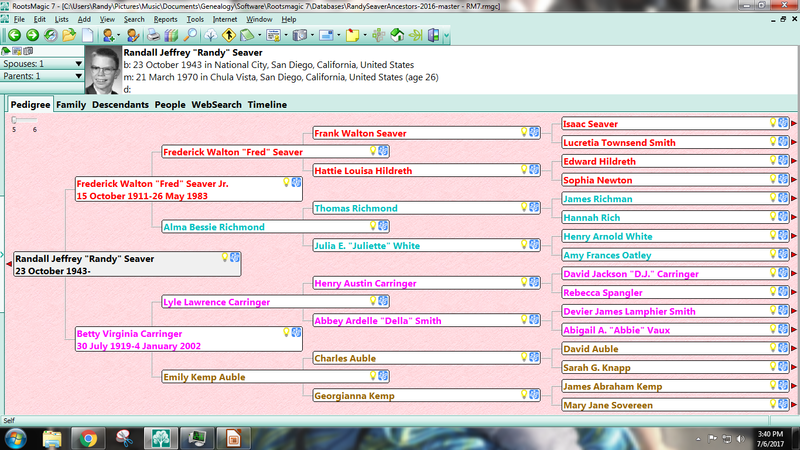 See points 3) and 4) in http://www.geneamusings.com/p/randys-genealogy.html for examples that I have uploaded to Scribd. These are searchable by most search engines. I (or my executors) could self-publish these and gift copies to my daughters and to local and genealogy libraries too. 4) Write books (with biographies, stories, and photographs) of my life and my Seaver and Carringer ancestry, and my wife's ancestry (all back to the second great-grandparents), publish them on Scribd and also self-publish them on paper and gift them to my daughters and grandchildren. I (or my executors) could gift copies to San Diego libraries, the Family History Library, the New England Historic Genealogical Society, and perhaps other genealogical libraries. 5) Provide a list of usernames and passwords for my desktop computer, social media websites and important genealogy websites to my executors so they can continue to maintain my RootsMagic database, my blog, and the online tree websites, in hope that someone (a daughter, a grandchild?) will continue my research. 6) Write a genealogical codicil to my will to make the above happen. Those are my plans - they probably will change occasionally as technology improves or I find other ways to do it. 6) I am interested in hearing other ways to "save your genealogy work" for posterity. Comments, please. Thank you to Rita for the question! As a follow up question Randy - what will happen to your website? So much teaching here. Will the site be taken down? Hi Randy, while reading this post, I was struck by the fact that we seem to be in an era where plagiarism is the norm rather than the exception. While I have not copyrighted my genealogy works, they have been copied by many with no attribution. Because something is published on the Internet it is not necessarily in the public domain. I am not so concerned with someone using data that is in a pedigree chart, as I am with someone taking my written notes and research and using it without any sourcing. It is trivial to look at someone's tree and notes and figure out if that data came from your genealogy or from someone's genealogy who has a 2nd or 3rd generation copy. I know this is off-topic, but it is cause for concern. I believe that with the right sort of "rights" statement, your document would also be available to the public through the FamilySearch Books feature, which includes books from the ACPL collection. Thank you Randy. I can see I need to learn more about these things. I've been out of the genealogy loop for awhile but getting back to it. I appreciate other comments too, especially the copyright/credit one. Another concern as I see my photos all over Pinterest. I have not felt comfortable putting my info on any sites but I guess that will have to change. Thank you again for picking up on my comment, and for all the information you share. Thanks Randy for sharing your ideas on this topic. For me, updating my Ancestry tree has been a manual chore. After reading your recent postings on RootsMagic's Ancestry support, I'm hopeful that TreeShare will make it possible to upload changes to my tree with citations that look presentable. If that works out, it will be much easier to keep my public family tree reasonably up-to-date. Another way that I hope to share and preserve my research is to apply to local lineage societies. The ones that I am targeting are at the county or state level. The applications are preserved and indexed by the lineage society and publicly accessible. It is also reassuring to have my research vetted! I am doing a workshop on this subject in August and may include some of your ideas (with attribution!). Also, when I redid my Trust last year I added a Genealogy Codicil leaving my material to four different societies where my family lines were located for a number of years. If the society takes my material they get $1,000.00 (a bit of a carrot). The problem is that right now my material is not organized and not much in the computer so no one would want it - major goal for the next few years is to get all my material organized, into the computer and some articles written!!! No problem wondering what I am going to do. I have always entered a discreet error in my genealogy....if someone has copied my material...I know it and ask them to give ME credit for the work. If they refuse... I let everyone know I have been plagiarized and give their names. Data might be free...but my work isn't....Give Me the Credit. Great ideas Randy. I would add one more, on FamilySearch you can upload an entire gedcom that cannot be changed. Go to FamilySearch, login, hover over "Search", choose "Genealogies", scroll down and click "Submit Tree". I love that trees can be preserved this way. I often search user submitted trees, especially the ones from excellent researchers, to get clues about what records they used to draw their conclusions.